Book Report, "Happier at Home"
This series is my attempt to reconnect with my English major roots by writing mini-essays about books I think are worth adding to your reading list. First up, Happier at Home, a non-cheesy self improvement tome. I'd like to just start out by saying that I don't have a ton in common with "Happier at Home" author Gretchen Rubin in terms of taste and hobbies. She is perfectly happy wearing yoga pants and a North Face computer backpack as a purse every day. Besides not being interested in fashion, travel isn't big on her list at all either. Or desserts. She decides that she will feel better about life if she doesn't eat a single sweet during the Christmas season and manages to accomplish that easily. On the other hand, my tastes unfortunately lean toward ultimate consumption. I dream of wearing a cute new outfit while eating ice cream on vacation. 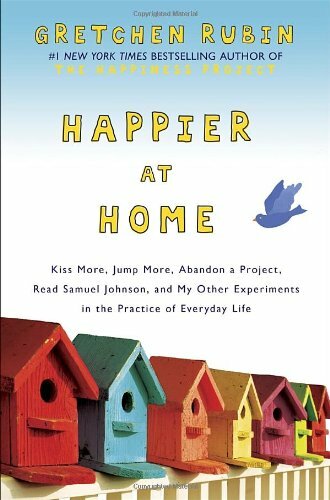 So while we are opposites, and despite the fact that Rubin says at one point in the book that she's not very good at telling jokes — I may have nodded my head while reading that — I really enjoyed reading Happier at Home, the sequel to The Happiness Project. As a reader, you feel like you're part of Rubin's family and they seem like a loving, content bunch. And Rubin writes thoughtfully on parenting, marriage, and the physical realities of her home, incorporating arresting quotes from philosophers and writers about life and happiness. I like the idea of living an examined life, and following through on steps to make your life better. Personally, I was intrigued by the first chapter about possessions and organization. I like that she doesn't equate possessions and consuming as shallow or detrimental to happiness. Rubin writes: "For better or worse, buying things (or photographing them, cataloging them, or writing reviews about them) is a way to engage with the world. When we're interested in something, we often express this interest by researching, shopping, buying, and collecting." I love fashion and home decor. I'm drawn to design, and I spend a ton of time reading fashion blogs and magazines for fun. But at the same time I know it's just stuff. If I bought everything I ever wanted, I would always want more. I suppose I feel conflicted about loving and wanting things. While I love shopping, I hate having too much stuff. Having to store it, and look at it, and get sick of it. Rubin understands the ties of ownership that can weigh us down. And her answer is engagement: to only own things that you use regularly or have meaning to you, and for those things to be organized. I think this is a book I'll come back to as a way to simplify and improve my every day life, and I need to check out her first book too. What are your thoughts about possessions? What would make you happier in 2013? Posted in Books and Movies and tagged with Book Report. January 30, 2013 by Adele Chapin.